Over the last four years, Google made a few significant changes to the way they serve ads for exact match queries. According to Google, their reasons for making these updates were to expand audience reach and make it easy for business owners/advertisers to reach more customers, regardless of slight variations in the way people search. These changes not only impacted the way ads are served to users on the search results page, but they also impacted paid metrics. This blog post will walk you through the evolution of Google’s update for the exact match keyword type and the impact of these changes on advertisers’ campaigns. Prior to Google making any changes to the way exact match keywords trigger search ads, only if someone searched a keyword in Google and an advertiser was bidding on the exact match for that keyword, would Google display the advertiser’s ad. A visual example will help explain this further. In the screenshot below, the user searched [baby clothes]. The advertiser (H&M) is bidding on the exact match version of the term. Therefore, Google triggered the H&M ad. In 2014, Google made the first change to the way they serve ads for exact match keywords. The search platform started showing ads for plurals, misspellings, and other close variants of the “exact match” term. Again, Google’s reason for making this change was to show users more ads despite slight variations in the way they searched. As you can see from the example below, the user searched [baby clothes], but the advertiser is bidding on the keyword [baby clothing]. Because Google’s update includes showing ads for keywords with close similarities, Google showed the ad that included [baby clothing]. Part 1: Google will match an ad to a keyword where the function word (ex. an, to, but, for, from, etc.) is ignored, replaced, or added—in theory only if Google deems the search intent as similar. The second part of Google’s update affects word order. Part 2: Google will serve an ad that uses the same words, but in different order, than that of the exact match keyword. In the example below, the user searched [dress shirt men’s], and the advertiser is bidding on the exact match keyword [men’s dress shirt]. Google changed the order of the word and triggered the ad with the keyword [men’s dress shirt]. How Did the Exact Match Updates Affect Advertisers? Advertisers have less control over what queries will trigger ads. There was an increase in irrelevant searches matching your ads. There was a shift in PPC metrics. The shift in PPC metrics peaked my interest the most, and I was eager to find out how the updates to exact match keyword ad triggering impacted WSD clients. To do this, I surveyed my peers in the PDM department. The study consisted of data collected from 15 AdWords accounts across the PDM team. 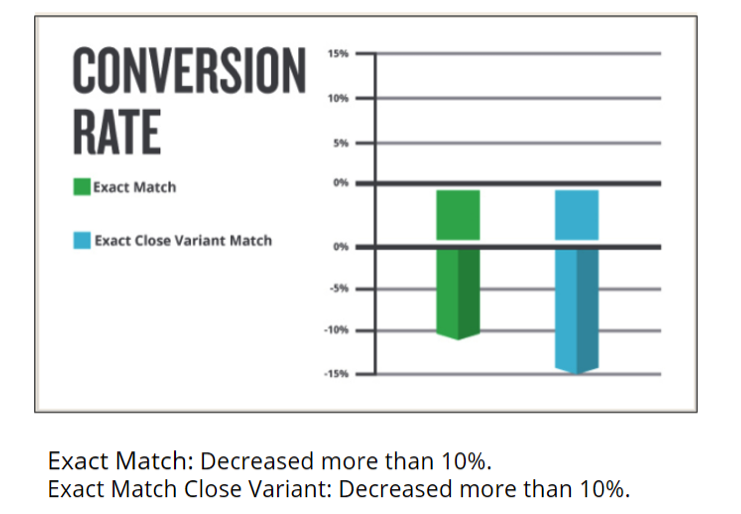 The survey analyzed the impact the update had on click-through-rate, impressions, and conversion rate for exact match keywords vs. exact match close variants. The survey examined the performance of non-branded keywords one month before the change and one month after Google made the updates. 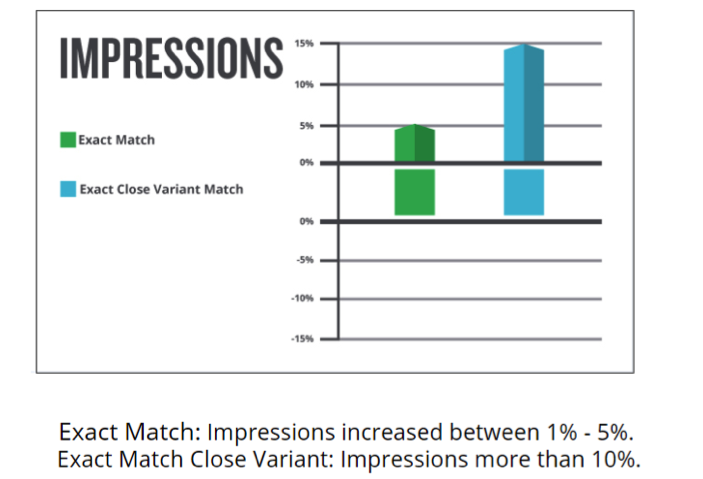 Across the board, PPC ads are shown more frequently because they are matching a broader range of keywords; this is made evident by the higher percent increase in impressions for exact match close variants after Google’s updates. 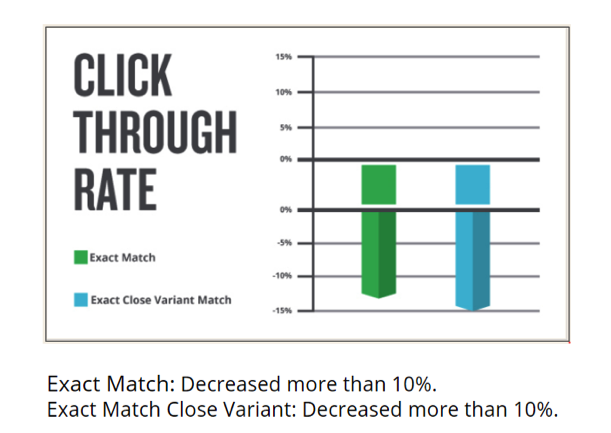 As ads are being matched to more searches, there was a slight decline in relevance, which affected click-through-rate for all exact match campaigns, but exact match close variants saw a larger decrease. Conversion rate fell across accounts for these campaigns, an indication that the clicks we were generating are less relevant. Analyze search terms reports for any new irrelevant queries triggering your ads. Continue to add irrelevant terms to your negative keyword list. Have you seen an impact on your accounts? We would love to hear how this change has affected you.